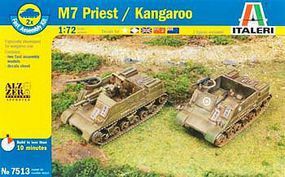 Shop online for over 400 italeri plastic models at discounts up to 70%. Cars / Trucks / Vehicles is the most popular of the 8 italeri plastic models categories, then Figures, and Airplanes. This is a 1/35 WWII Willy's Jeep made by Italeri.:. The Willy's Jeep was perhaps the best known vehicle used during WWII. Produced by both Willy's and Ford, over 600,000 Jeeps were built during the war. Jeeps were still in use during the Korean conflict. Eventually replaced by the Ford MUTT, many WWII-era Jeeps are still operating today in civilian hands.:. 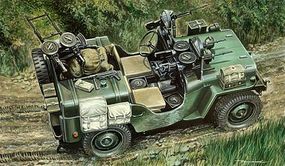 This is a Commando Car Version of the WWII Willy's Jeep Vehicle from Italeri.:. 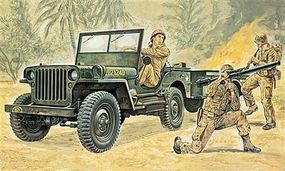 The Willy's Jeep was perhaps the best known vehicle used during WWII. Produced by both Willy's and Ford, over 600,000 Jeeps were built during the war, and the Jeep was still in use during the Korean conflict. Eventually replaced by the Ford MUTT, many WWII-era Jeeps are still operating today in civilian hands. The Commando car version of the Jeep was modified with five machine guns and tanks holding an additional 35 gallons of fuel.:. 1: Overall: Olive Drab. Detail Colors: White, Black, Silver, Steel, Flesh, Red Brown, Wood Brown, Mid- Stone, Khaki, Green, Clear Red.:. 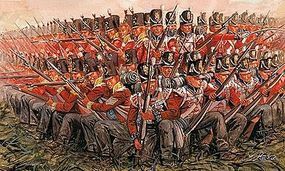 This is the 1/72 Scale Napoleonic War British Infantry 1815 Plastic Model Military Figure Kit by Italeri. Suitable for Ages 10 & Up. 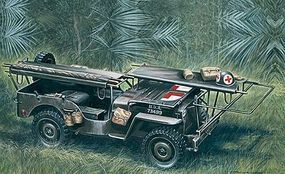 This is the 1/35 Scale 1/4-Ton 4x4 Ambulance Jeep D-Day Plastic Model Military Vehicle Kit from Italeri. Suitable for Ages 14 & Up. 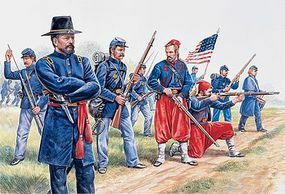 This is the 1/72 Scale Union Infantry/Zouaves Plastic Model Military Figure Kit from Italeri. Suitable for Ages 10 & Older. 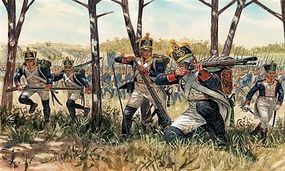 This is the 1/72 Scale French Infantry Napoleonic War Plastic Model Military Figure Kit from Italeri. Suitable for Ages 10 & Older. This is the 1/72 Scale Sherman M4 A3 (2) Plastic Model Military Vehicle Kit by Italeri. Suitable for Ages 10 & Up. Assemble the V-22 Osprey Convertoplane with this 1/48 Scale Plastic Model Kit from the Modern Aircraft Series by Italeri. Modeling Suitable for Ages 10 and Older. This is the 1/9 Scale WLA 750 Plastic Model Kit by Italeri. Suitable for Ages 14 & Older. 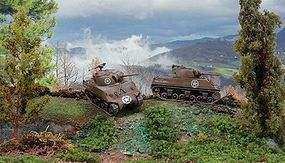 This is the 1/35 Scale M4A3E8 Sherman "Fury" Plastic Model Kit from Italeri. Suitable for Ages 14 & Older. This is the 1/72 Scale Vietnam Vietcong Plastic Model Military Figure Kit from Italeri. Suitable for Ages 10 & Older. This is a 1/24 set of Truck Accessories for European and American Trucks, manufactured by Italeri. For ages 10 and over.:. This is a 1/35 BMW R75 Motorcycle and Sidecar from Italeri.:. The BMW R75 was classified by the German army as a heavy motorcycle since it had an engine displacement of over 500cc. Along with the Zundapp KS750, it was used heavily in North Africa since it was able to handle the adverse terrain. After about 1943, motorcycle use in the German army were replaced by 4-wheel vehicles. The BMW R75 featured a horizontally opposed two cylinder engine with 746cc displacement and a max speed of 92 kmh. It was often fitted with a sidecar which mounted a MG34 machine gun.:. This is the 1/72 Scale American Civil War Union Artillery (13, 8 Horses, 2 Guns) Plastic Model Military Figure Kit from Italeri. Suitable for Ages 10 & Older. This is the 1/35 Scale M923 "Hillbilly" Gun Truck Plastic Model Kit by Italeri. Suitable for Ages 14 & Older. This is the 1/72 Scale C-47 Skytrain Plastic Model Airplane Kit from Italeri. Suitable for Ages 14 & Up. This is the 1/72 Scale German Infantry Plastic Model Military Figure Kit from Italeri. Suitable for Ages 10 & Older. This is the 1/72 Scale XI Century Crusaders Plastic Model Military Figure Kit from Italeri. Suitable for Ages 10 & Older.